Experienced climbers should head to Marston Mountain to enjoy 18 climbing routes along the 7,343 foot mountain side. Summit Fitness Center features the only indoor climbing wall in northwest Montana. To learn how to rock climb some of Montana’s stunning vistas at Rock Climb Montana and Glacier Adventure Guides in Whitefish. A popular spot for local climbers with 14 or more bolted anchors. Location: Located south of Eureka, there are 18 routes up the 7,343 foot mountainside with 14 or more bolted anchors. Climb the 50 foot black metamorphic west-facing rocks along 7,329 foot Stryker Peak. Location: Located 3.6 miles east of the town of Stryker. The climbing wall features hundreds of hand holds. Classes are held for beginner to intermediates. Difficulty: 30 feet high and 38 feet high. Location: 205 Sunnyview Lane, Kalispell. Just south of Glacier National Park, Skiumah Creek Trail winds up the hillside for 1.9 miles to Skiumah Lake. There are north facing limestone crags here which are popular for sport and ice climbing. Trailhead: From West Glacier head east for 10 miles and you’ll find West Glacier Rocks on the right side of the road. I am looking for a guide…. In Whitefish, Rock Climb Montana offers half-day, full-day and customized trips for beginner to advanced climbers in Kila, Kalispell and Koocanusa. 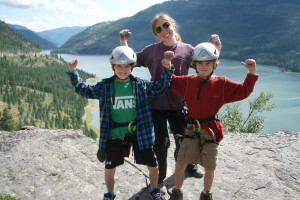 Glacier Adventure Guides in Whitefish offers climbs to Stone Hill at Lake Koocanusa for new climbers to intermediate.